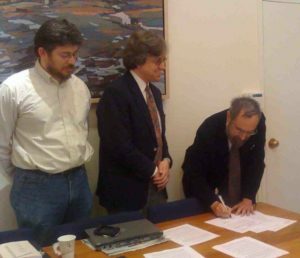 Tuesday, June 2, 2008, marked the signing of a letter of agreement between Amherst College and the Anacapa Society. 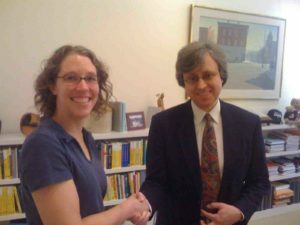 On hand to sign for the board of the Society were Herb Bernstein (Hampshire College) and Courtney Lannert (Wellesley College). Greg Call, Dean of Faculty at Amherst College represented the College and Will Loinaz, in his role as liaison between the Society and the College, ushered us all through the process (see photos, below). The signing of this letter of agreement formalizes and recognizes Amherst College’s hosting relationship with the Anacapa Society. As the hosted, the Anacapa Society receives physical and institutional support from the College, such as basic office needs and web hosting and support. As host, Amherst College gains a strong and supportive association with the first-ever national organization devoted to promoting and supporting research in theoretical and computational physics at primarily undergraduate institutions. We look forward to a long and fruitful association!